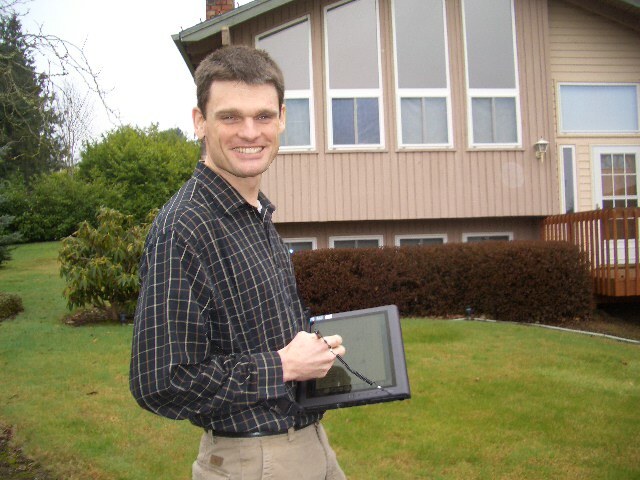 We are a small local team of highly trained and experienced real estate measurers and Portland home energy assessors providing Home Energy Scores and floor plans. We offer an independent and unbiased source of home or commercial building measurement, attractive floor plan drawings that differentiate real estate agents, City of Portland Home Energy Scores, easy online ordering, easy pricing, and quick delivery. Most single-family Portland Homes, inside the Portland city limit, now require an energy assessment (not audit), called a City of Portland Home Energy Score, prior to listing. This is a perfect fit for our company since Home Energy Scores are simply measurements of elements including conditioned area, attic area, ceiling height, insulation depth, window area, duct area, etc… Accountable and efficient measuring is what we do! 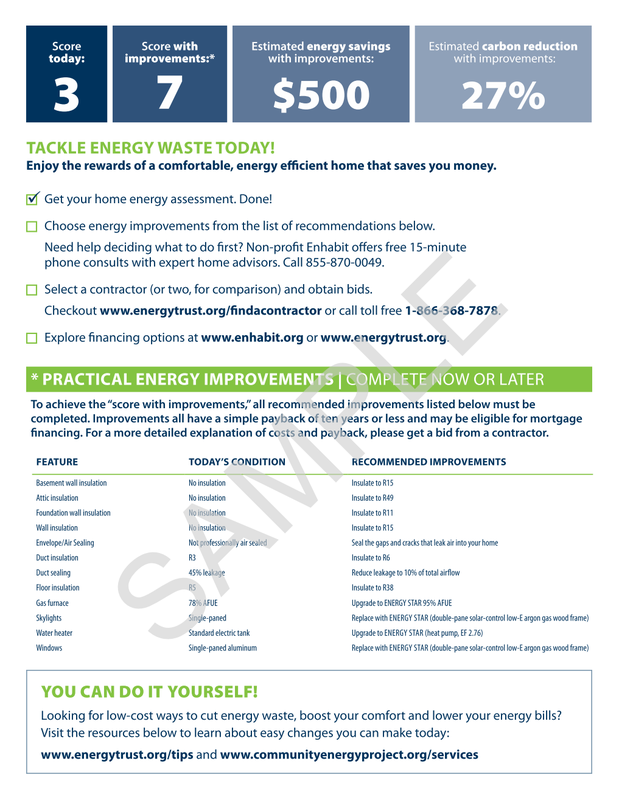 We are independent, do not subcontract, and have no agenda to sell home energy improvements. We offer same day delivery, easy online scheduling, low prices, no prepayment, cancel anytime, professional staff, a record of satisfied customers, and we can also add any floor plan or measurement to your Home Energy Score at half price. Home Energy Scores cost just $175 for homes under 3,000 square feet. Click here for full list of prices. 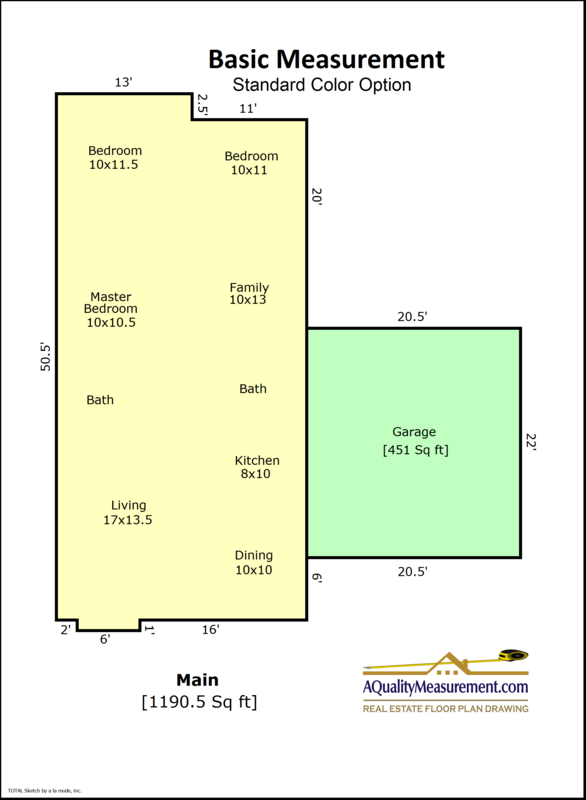 Basic Measurement is just a simple drawing that shows the approximate square footage of each area of a home or building and the approximate room dimensions. This level of service is $125 in our Standard Service Area if under 4,000 square feet. Click here for full list of prices. 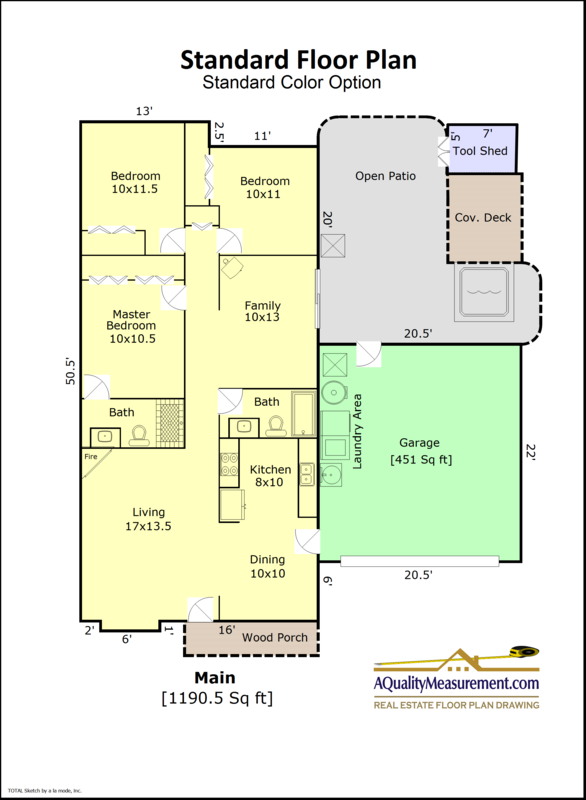 Standard Floor Plan depicts the interior walls, doors, and rooms of a home. This is our most popular product. This level of service is $150 in our Standard Service Area if under 3,000 square feet. This service is useful for designers or builders looking for a detailed and editable 3D model of a home (or just a room within a home) with outputs to CAD programs including SketchUp and Revit. Click on the image to explore the 3D example. The makers of the scanning hardware and software claim an accuracy of 1-2% when they render the scans into CAD files using a mixture of software and human inputs. We have seen some errors greater than 1-2% in testing, but we have the option to take laser measurements of critical details so that the model is accurate in the areas where it needs to be. In this way, you get the best of both worlds - you can rely on the scan for all the dimensions where our expected tolerances are acceptable, and include manual dimensions for the (typically much smaller) number of dimensions that demand higher precision. Since you will receive an editable CAD file in the end, verification and small adjustments can be made where necessary while still saving a great deal of time. Pricing is $150 for the scanning session plus $25 for each 2D SketchUp scan, $40 for each 3D SketchUp scan, and $50 for each Revit scan. Most rooms, halls, and baths are equal to one scan, but some large rooms could require more than one scan. If you don’t see the area you’re looking for, Contact Us. We would love to help. 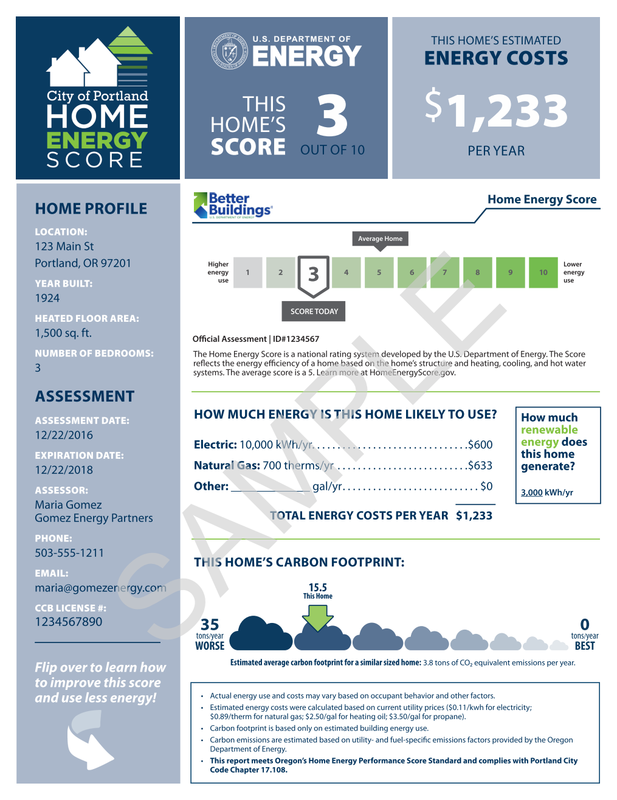 Official Home Energy Scores only available in City of Portland. East Portland Service Area includes areas east of the Willamette River including East Portland, Canby, Oregon City, Clackamas, Milwaukie, Happy Valley, Gresham, and Troutdale. West Portland Service Area includes areas west of the Willamette River including West Portland, Beaverton, Tigard, Hillsboro, Tualatin, and Wilsonville. Vancouver Service Area includes Vancouver and Camas. East Side Extended Service Area includes Aurora, Molalla, Colton, Estacada, Eagle Creek, Sandy, and Corbett. West Side Extended Service Area includes McMinnville, Newberg, Dundee, Yamhill, Carlton, Forest Grove, North Plains, Banks, Warren, and Scappoose. North Coast Extended Service Area includes the following Clatsop County cities: Seaside, Cannon Beach, Arch Cape, Gearhart, Warrenton, and Astoria. 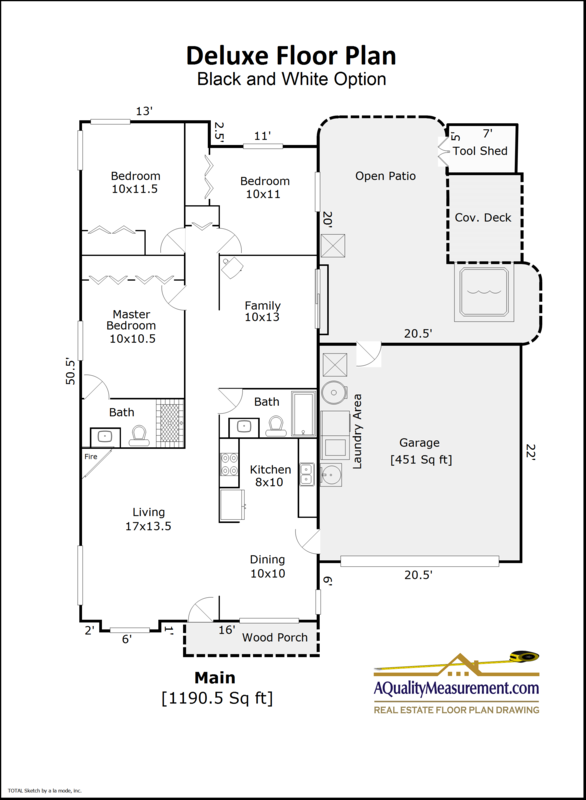 Pick your floor plan sketch, Home Energy Score, or 3D scan and schedule online. No prepayment necessary. As long as you received a confirmation email when scheduling, our measurer or home energy assessor will arrive at the property at the desired time ready to measure. Special requests are no problem, just ask. At the property, our measurer or home energy assessor will start outside to measure the approximate shape of the building. decks, and outbuildings using a tablet computer and laser. 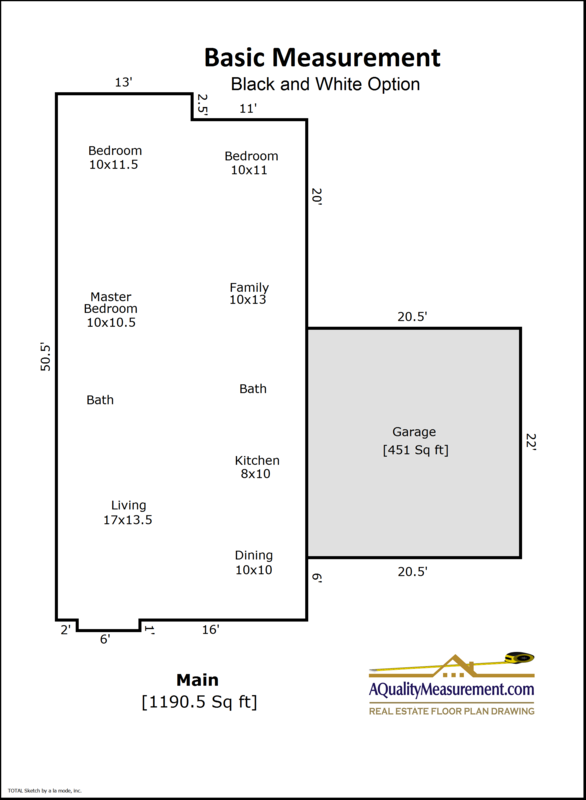 On the inside, he/she will measure every wall to complete a draft of the floor plan sketch. For an energy score, the assessor takes notes throughout the house including in attic and crawlspace. Your measurement or home energy score is routinely delivered by email late the same evening as we measure. You will also receive a secure online payable invoice in a separate email from. We are happy to make edits to room names etc… within 24 hours. Just ask, our goals are quality and complete satisfaction.